If you are familiar with the Bible, you probably remember the story of Jesus walking on the water. And if you remember that, you may also recall that the apostle Peter was the one who walked on the water with Jesus – until he began to look around. But if you don’t remember the story, here it is as found in the NIV version of Matthew 14:25-33. During the fourth watch of the night Jesus went out to them, walking on the lake. When the disciples saw him walking on the lake, they were terrified. 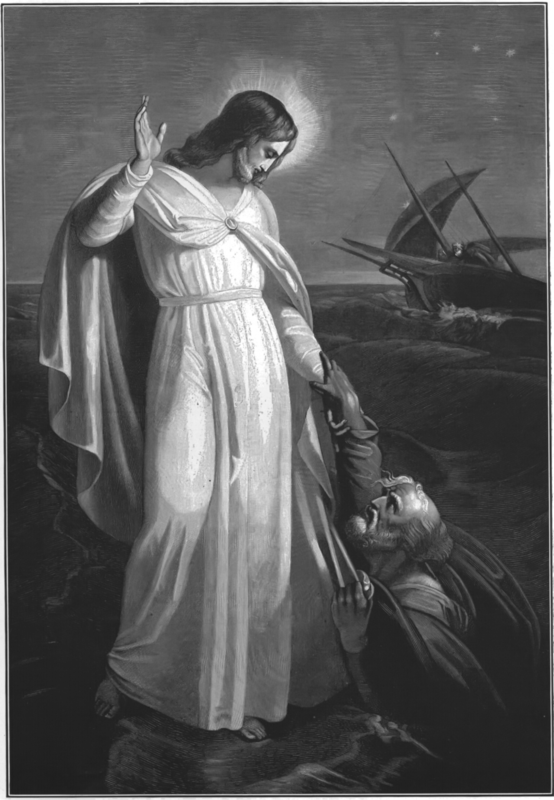 “Lord, if it’s you,” Peter replied, “tell me to come to you on the water.” “Come,” he said. Then Peter got down out of the boat, walked on the water and came toward Jesus. Now that you are familiar with the story, have you ever seen paintings or illustrations depicting this passage of Scripture? Of all the ones I have ever seen, Jesus is usually portrayed as a calm, sad-looking, and often effeminate water-stroller. Peter is always some scruffy-looking, heavy-as-stone fraidy-cat. Then what about those waves? In all the depictions of this story, how high are the waves? Usually they are no more than just a few inches high around the Lord and his bobbing disciple, Peter. Well, I am here to challenge the common perception based on these fallacious (that means stupidly wrong) paintings. I am not a seafaring man like my friend David Welford, but I would bet even he would say that 6-8 inch waves would have been NO problem for some experienced fishermen. What ever frightened Peter, once he looked around, had to have been more than a ripple on the surface. Consider how the Bible described what was happening to the boat in Matthew 14:24: “But the ship was now in the midst of the sea, tossed with waves: for the wind was contrary.” Do kiddie pool waves toss a boat? No, but real waves do. In stead of tossed, other translations use words like buffeted, beaten, and battered. 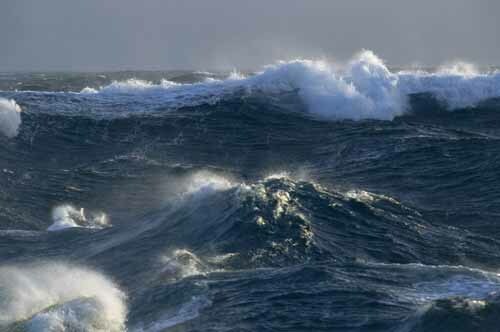 The New Living Translation says that “a strong wind had risen, and they were fighting heavy waves.” It would seem to me that the disciples were facing a life-or-death struggle, not inconvenient weather. People often belittle Peter for his “lack of faith.” They think less of him because he took his eyes off of Jesus and began to sink. But who on this earth that is not currently on anti-psychotic medication would actually ask a UWG (Unidentified Walking Ghost), “If it is you, compel me to do something totally irrational and dangerous, OK?” What kind of crazy question was that? I believe there is more to this story than we have been told. Why didn’t Peter just ask Jesus to come a little closer? Why not just ask Him to get in the boat and take a load off? What would have caused Peter to think of leaving the boat? Maybe, just maybe, what Jesus was doing looked like fun. The next time you look out over a stormy sea capable of sinking a boat, try to find the smooth spots. The paintings that show the Savior walking delicately over glassy H2o in the middle of a gale are unrealistic. Seriously, just stop and think about it. Here was a storm that was beating up a boat and wearing out the crew; waves that were anything but small; a boat full of panicking people; and a Man walking on water. Peter must have concluded that if there was going to be any place to be, it was with Jesus, riding the waves. We can’t help the fact that storms come. But if there is any lesson to be learned from this story it is that the worst possible place to be can be the safest and most peaceful, as long as our eyes are on Jesus and we are walking with Him. Does it make sense? No. Is it irrational? Maybe. But as long as we have faith in Jesus, we can ride atop the tallest tsunami, admiring the view. That’s right, the penalty prescribed in God’s Law for violation of that law is the death penalty. The penalty is not penance, or purgatory, or a monetary fine or any sort of good works to make up for what we have done. The penalty for our sin is death. What does this mean? Well, after the first sin, it meant physical death. If Adam and Eve had not sinned, they would have lived forever in their physical forms, in harmony with God. Their sin brought into the world all the sickness and death as we know it today. Death also means spiritual death. Even though we all eventually die physically, we are are all eternal in our spirits. Our spirit, or soul will exist for all eternity. So, again, what is it to spiritually die? Spiritual death is eternal separation from God in a place of torment we call Hell. It’s really that simple. When God says the wages of sin is death, that is the death of which He speaks. The penalty is due; we all owe it, for we have all sinned and transgressed God’s law. And each and everyone of us can pay that penalty ourselves if we want to. We each owe it, and we can each pay it. I could have payed for my own sin; you can pay for yours if you wish. But that’s the point of this article. We don’t really want to pay our own way; we don’t want to suffer eternal death in a place called Hell. God has given us a gift. Even though we owed the penalty of death for our sin, He have us His Son, Jesus Christ as a way for that debt to be satisfied. God became flesh, in the form of Jesus Christ and became incarnate on this Earth for that very reason. Jesus Christ was fully human, so He could pay the price humans owed for their sin; He was also fully God, so He could pay the infinite price of the sin of all humanity past, present and future. Despite how He hates sin, God loves us deeply and completely. It’s simple really. We have to confess Him. Basically we have to agree with Him that our sin is wrong and understand we should have paid for it. We agree with God that our sin is wrong and turn away from it. We call that repentance. We also need to believe that Jesus paid the price we should have paid ourselves, and to trust Him as our Savior and Lord. And finally, we do have to call on Him. Romans 10:13 teaches that. The gift is available, and it is free; however God will not force it on anybody. He does require that we call on Him and ask for that gift. Jesus paid it all. Four words full of meaning. We all have a choice. We can pay our own way or we can accept that Jesus has already paid our way, if only we repent toward God and believe in Jesus Christ. 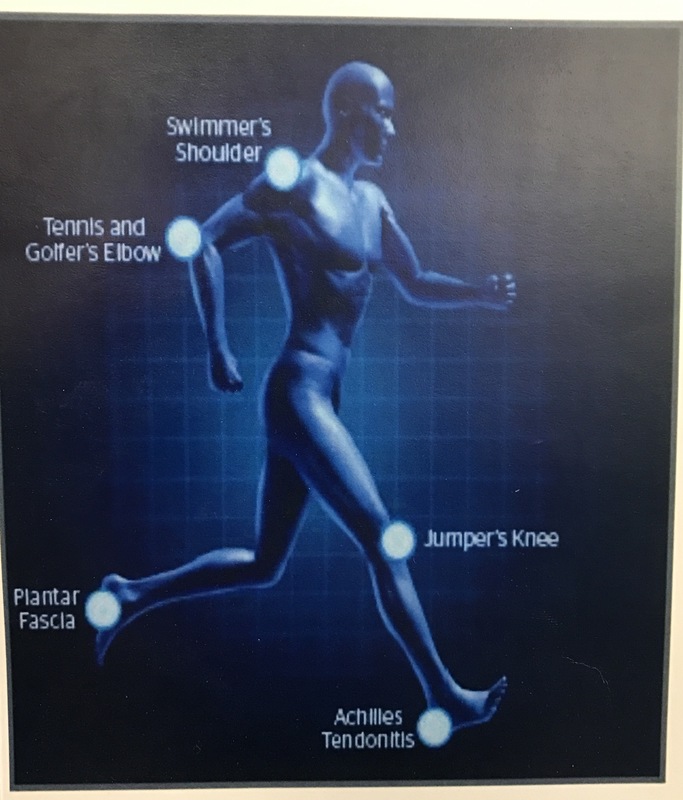 The other day I saw a poster on the wall of my physical therapist’s office. I took a picture of it just for you, my readers. “Already on it,” said I to self. So, here is the poster, followed by my thoughts. By the looks of it, running, golfing, tennis, and swimming can do almost as much harm as good! I mean, exercise could kill you! On the other hand, the Apostle Paul didn’t totally dismiss exercise; he admitted there was a “little” profit. The thing to remember is that no matter how healthy you become, death is following close behind. It’s our spiritual health that matters most of all.